(15/115) TRENTON – Department of Environmental Protection (DEP) Commissioner Bob Martin and staff delivered holiday presents for more than 200 children to the Salvation Army Corps in Trenton today, as part of Governor Christie’s annual Season of Service campaign that assists state residents in need during the holiday season. DEP staff donated the gifts to the Salvation Army’s Angel Tree program, which the DEP has been involved with for the past five years. The program provides new clothing or toys for children of needy families through the support of donors. DEP contributors purchased “wish gifts’’ for children from the Trenton area. Presents included assorted toys, games, bicycles, electronics, sporting goods, as well as essentials like clothing, diapers and bedding, plus gift cards. More than 30 million Americans receive assistance from The Salvation Army each year through the broadest array of social services that range from providing food to the hungry, relief for disaster victims, assistance for the disabled, outreach to the elderly and ill, clothing and shelter to the homeless, and opportunities for underprivileged children. 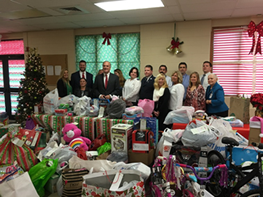 The Salvation Army West Central Region serves Mercer, Hunterdon and Somerset counties, and is collecting toys and gifts for a little more than 900 families representing about 3,500 children through its Angel Tree effort this holiday season. The Angel Tree program was created by the Salvation Army in 1979 by Majors Charles and Shirley White when they worked with a Lynchburg, Virginia shopping mall to provide clothing and toys for children for Christmas. The program got its name because the Whites identified the wishes of local children by writing their gift needs on greeting cards that featured pictures of angels. They placed the cards on a Christmas tree at the mall to allow shoppers to select children to help.